Even if you’ve used Google Maps for years, you may be missing out. 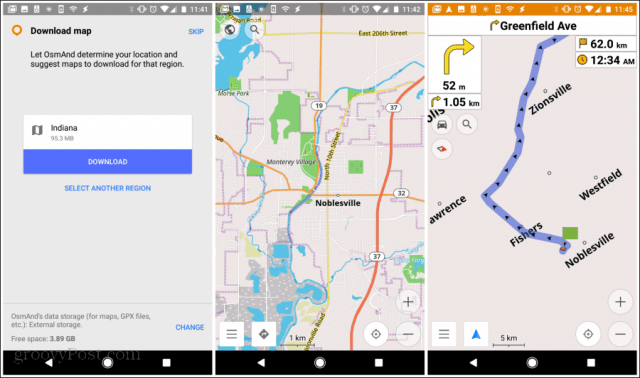 Try out a few of these Google Maps alternatives and see if they might be better for your mapping needs. Google Maps is an excellent navigation and mapping tool, but there are actually many Google Maps alternatives that are as good or better for a number of reasons. Your choice of mapping tool really depends on how you plan your trips, and how you use your maps. Do you like planning out your trips at home on your computer, or are you doing most of your trip planning and navigation from your phone? 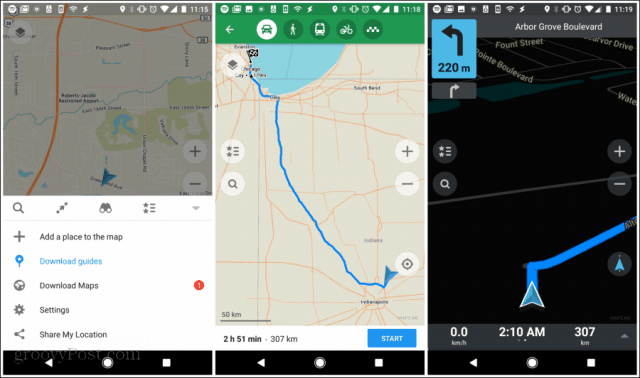 The following list highlights the features and all of the pros and cons of each Google Maps alternative so that you can choose the perfect mapping tool for your situation. MapQuest has been around for about as long as Google Maps has. It offers both a web-based tool as well as a mobile app. With a MapQuest account, you can sink all of your navigation plans between the web and your phone. MapQuest works much like Google Maps does when it comes to searching for locations and finding directions. It’ll recognize your current location based on your IP address (if using the web) or your phone GPS (if using mobile). Just type in a location and click Get Directions to see the route. Route directions are very accurate and include current traffic levels, distance, and even estimated fuel costs to make the drive. A hovering tool along the right provides you zoom controls, satellite or traffic views, and share or print buttons. The MapQuest mobile app actually has more features than the web-based tool. It offers more one-button location finding options like hospitals, parking, post office, schools and more. It also displays the current temperature at your location. Directions include estimated fuel costs. An integrated tool for quickly finding hotels and making reservations. One-button tool for finding gas stations, grocery stores, coffee shops, shopping areas, food, and hotels. Re-routing planned trip path is more user-friendly. The web tool is covered with several very annoying ads that block the map view. Route planner has fewer features than Google Maps. The route is slightly less accurate than Google Maps and doesn’t update as frequently. If you visit the Waze website, it doesn’t look like there’s a web-based tool at all. That is until you click the Live Map link in the menu. The web tool is really meant as a supplement to your mobile experience. The Live Map lets you quickly search for destinations and plan routes, click locations on the map to drop pins or add destinations, and use the Waze Map Editor to customize your own map of any area. 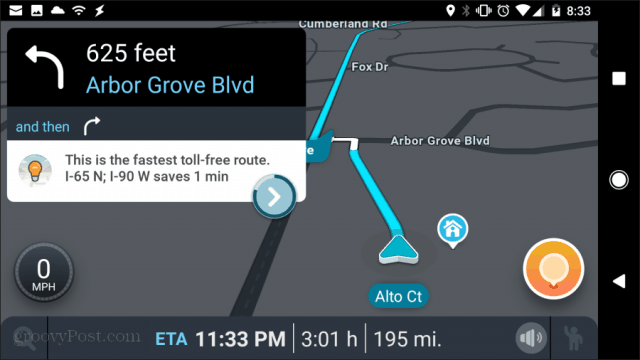 The Waze mobile app is one much more fun to use than most other navigation tools out there. This is because of the social integration it offers with other users (called Wazers). You can quickly share traffic or police alerts, hazard warnings, note cool places, post camera shots, or ask for roadside help. More of a social driving experience. Better warnings about crashes, speed traps, and more. Integration with your mobile music apps. Online and mobile trip planning with scheduled departure times. See and interact with other users around you. Maps are less detailed on both the web and on mobile. Navigation mobile view is more cartoonish. Far fewer features than other navigation tools. Bing Maps is probably one of Google Maps most direct competitors. However, Microsoft doesn’t just try to copy the Google Maps interface to compete. Instead, you’ll find a fresh and clean user interface that’s very simple to use. All controls for directions, traffic, sharing and more are lined up along the top. Bing Maps has all of the same features you’ll find in Google Maps, including road, aerial, and streetside layers, as well as transit and walking maps in addition to driving. It’s very easy to add destinations all along the route, and then print the map to take with you on your trip. Maps are extremely detailed with multiple layers available. The user interface is modern and easy to use. Map tools and features situated all around the edges of the map. Easily save places to your personal library. No mobile app is available. Overall fewer features and tools available. Even though there’s no mobile app available, it is possible to use the Bing Maps website on your smartphone, but it could use up more data than other navigation apps. 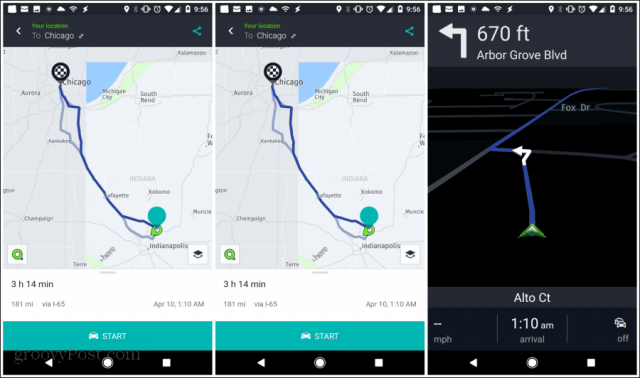 This navigation service may not be quite as well known or popular as Google Maps or MapQuest, but it has its own unique features. The Here WeGo mobile app is well known, but there’s also a website worth using if you want to take some time before you head out to plan out your trip. The online map interface is clean and simple but filled with great features like many route options like transit, taxi, or even car sharing routes. There are also just as many layers as Google Maps, including transit, traffic, satellite, and terrain. You won’t find advanced route planning or any extra bells and whistles that you may find with Waze or MapQuest, but that’s because the crown jewel of Here WeGo is the mobile app, and that’s where you should be using it the most. It’s simple to use. With just a couple taps you can switch to satellite, transit, traffic, or classic view. When you first open the app you can set your home location. After that, just type your destination and launch the navigation tool to start driving. The website and the app are perfect for minimalists who don’t want a lot of distractions from their navigation app. With the app, you just set your destination and go. That’s it. Must faster to plot a route and start navigating. Large, easy to follow mobile navigation screen. Fewer distractions in navigation mode. No extra route planning tool or features like Google Maps. Adding stops while en route is more difficult. Far fewer features than Google Maps and other tools. One of the most well-known names in the mapping world is Rand McNally, the publisher of traditional map books for many years. Not to be left behind in the dust in the digital age, the company offers Rand McNally online maps. Using the Rand McNally online map website is simple. Just type your origin and destination and click Get Directions to see the route. Just like their paper maps, the online Rand McNally maps are detailed maps. You’ll spot even the smallest bodies of water and even obscure walking trails. The map tool itself doesn’t have the sort of transit and walking layers other online mapping tools have, it does have an impressive satellite view to see the contour of the land. You won’t find a companion Rand McNally mobile app, but for planning your routes to any destination, the online site is an excellent choice. More detailed than any other mapping service. Impressive and useful satellite view. Zoom tool is fast and simple to use. Quickly save locations to your own library. No transit, walking, or other layers. Far fewer features than any other online map tool. While there are other mapping services that only have a website but no mobile app, Maps.me is the opposite. This is a mobile-only service without any companion website. However, it’s also one of the few mapping apps that let you navigate anywhere offline. It’s a perfect way to save on your mobile data plan by downloading apps while you’re connected to your home Wi-Fi network, and using those maps when you’re mobile. It also doesn’t use a whole lot of storage. You can download general maps of the entire United States of America, consuming only 21 MB of your phone’s storage. You will need to download more detailed maps when you plan more specific routes. Includes traffic and subway layers (subway layers don’t work with other online mapping apps). Discover nearby businesses and attractions. Download free travel guides for your destinations. Bookmark and store locations in the cloud. Features small ads on the app display. Can’t search for specific businesses, only map addresses. Far fewer features than Google Maps. This service includes two services that work apart from one another. The first is the OpenStreetMap web mapping tool, and the other is the OsmAnd app that pulls data from the OpenStreetMap location database. OsmAnd is another offline mapping app that can save you on mobile data and help you keep track of where you are even when you’re off the grid. The OpenStreetMap website is simple, but it includes more features than many of the other simple online mapping services out there. You’ll find different layers available, very accurate route planning, and a detailed map of your route. Routing includes very accurate bicycle or walking routes as well. One drawback of this site is that entering the origin and destination is not quite as intuitive as other mapping services. Also, the online mapping site isn’t directly linked to the OsmAnd mobile app, so you can’t directly share saved routes. However, when you have your route finished, you can download the map as a file, transfer it to your phone, and load it into the mobile app for offline use. Using the OsmAnd mobile app, you’ll need to download map data for specific locations. This app downloads the fully detailed maps so uses a bit more space initially than Maps.me. The free version also includes only 7 free map downloads, so if you plan to travel a lot you’ll need to invest in the premium version. However, with those big downloads come lots of impressive detail. You’ll see icons for business types, walking paths, and even the direction of river flow. It’s great for scouting out areas, but not so good for real-time driving navigation. Doesn’t use any mobile data. Works completely off the grid. Slower to route than other mapping services. Web mapping interface is not very intuitive. Website and mobile app are not integrated. Driving navigation mode is basic and not very useful. As you can see, all of these mapping services have their own pros and cons. The one you choose depends on how you plan to use it. If you travel a lot off the grid, then offline access is critical. Do a lot of exploring in the city? Detailed maps are key. 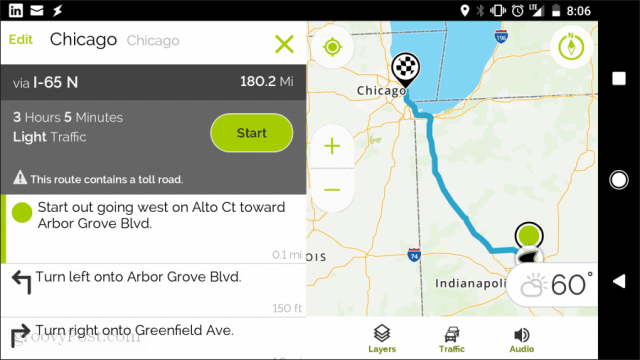 If you use your mapping app in the car, then ease of use is the way to go. Don’t stick with Google Maps just because it’s what everyone uses. Branch out and try a few of the ones listed above. You may find that one of them work much better for you.